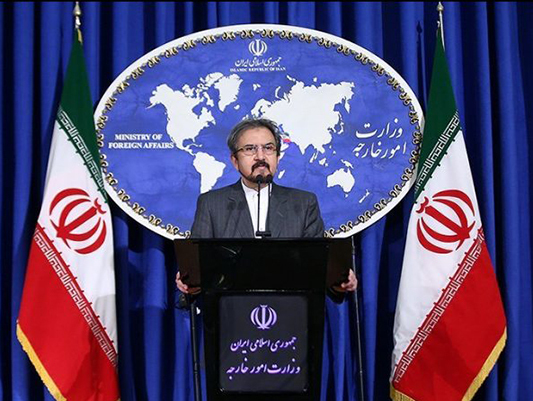 Iran’s Foreign Ministry Spokesman Bahram Qassemi says the United States seeks to launch a war of nerves against Iranians through economic pressure. “In order to cover up their crimes against Iranian people, US officials are using the tool of economic terrorism as well as unfair and illegal sanctions to find a pretext, launch a propaganda campaign and wage psychological warfare against Iranian people,” said the spokesman on Tuesday. Qassemi made the comment in reaction to US Secretary of State Mike Pompeo’s ‘deceitful’ claim that Iran’s economic growth rate has decreased due to its presence and fight against terrorism in the region. “Such comments are simply demagogic and deceitful, and amount to blatant fallacy,” he said. “Fighting terrorism in the region and the maintenance of peace, stability and security along Iranian borders, which has led to the failure of US authorities’ anti-Iran plans and made them worried, are no new plans and policies,” he said. “Iran’s economy has grown more than eight percent over the past years when our country has taken the lead in fighting terrorism and has been at the forefront of this holy campaign aimed at safeguarding human dignity at a time of global ignorance,” Qassemi noted. He said the White House is ignoring opposition to its Iran sanctions by other countries, organizations, legal institutions and human rights bodies. “Current US government officials have based their deceitful policies and approaches in bearing animosity towards Iranian people on the pipe dreams of hated and outcast regimes, individuals and terrorist groups,” he said. Qassemi underlined that such policies are just pipe dreams and exactly similar to the very same strategic mistakes and errors that the US has repeatedly made over the past four decades. “Following all these failures, they have, unfortunately, been unable to adopt a wise and civilized approach that would benefit humanity and the international community,” he said.